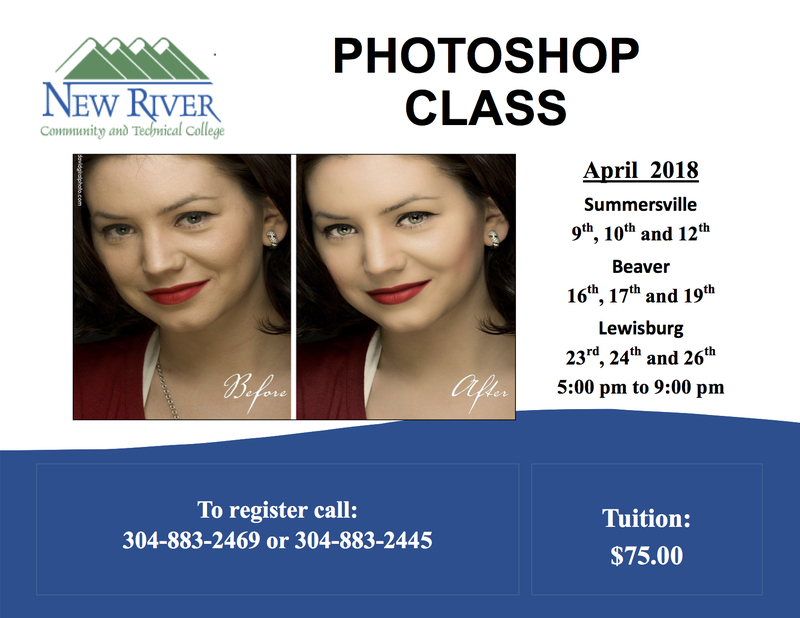 [BEAVER, W.Va.] Learn basic photo editing techniques in Adobe Photoshop classes scheduled during April 2018 at New River Community and Technical College’s campuses in Summersville, Beaver and Lewisburg. The three-evening classes will be held from 5 to 9 p.m. at the Nicholas County Campus on April 9, 10 and 12; the Raleigh County Campus on April 16, 17 and 19 and the Greenbrier Valley Campus on April 23, 24 and 26. The cost for the class is $75, and pre-registration for the course in Summersville is required by April 5, in Beaver by April 12 and in Lewisburg by April 19.